This post is a brief breakdown of film festivals. You will learn about what type of film festivals there are, how to get your film into festivals and what film festivals to submit to. I researched this information online and will include any links to useful sites that have helped me in the resource list at the bottom of this post. 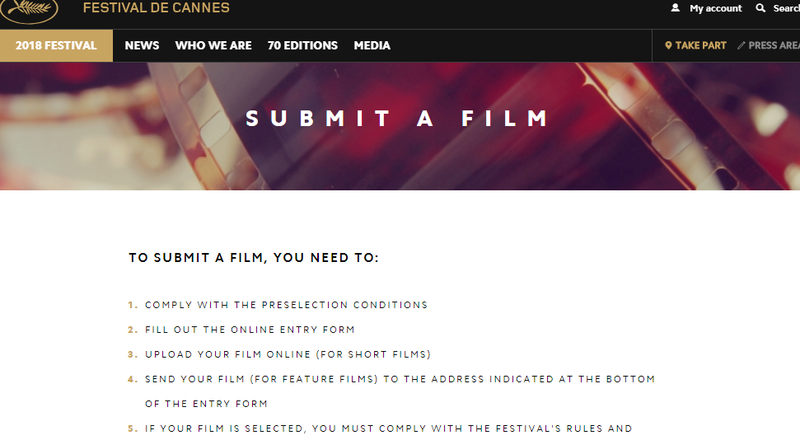 Why Submit your film into film festivals? You could upload your film directly online after completion. That is an option we presently have. In the past the only option for independent filmmakers to get their film seen, and hopefully be picked up for distribution was film festivals. However there are thousands of film festivals to enter - estimated 3000 active film festivals world wide. Prior research will need to be done before you begin to submit your film into film festivals. These are the smallest of festivals, set up by independents or local cinemas. The awards won at these will not be Oscar qualifiers, these can be great for mingling with the local film industry. You also stand more of a chance of getting your film into a festival if you are based close to the festival location. Niche film festivals focus on specific genres or disciplines. There are festivals for documentaries only (Sheffield Doc Fest) and ones for horror only (Fright Fest). So if you have a film in a niche genre or discipline such as animation entering into a niche festival is more likely to have investors looking specifically for films like yours. These are larger film festivals, they have huge submission rates but a screening at these festivals could lead to distribution and help with being taken seriously as a filmmaker. There are many festivals that fall under this category. I would include festivals here such as Raindance, SXSW, Slamdance and London. It is very hard to get officially screened at a major film festival even harder to get nominated for an award. Your film will need to be of top quality and exactly what the festival is looking for. The biggest film festivals in the world are arguable - Cannes, Berlin, Venice, Toronto and Sundance. Some film festivals prefer films of a certain genre or are on the look out for a specific type of film. This includes major festivals too. To find out if your film is good fit check what films have been previously showcased at the festival. Although it may be a dream to have your film shown at Cannes it may be better suited to a premier at a second tier festival instead. There are a lot of rules per festival submission. The major film festivals often demand that a feature film has its premier at their festival. That is why you can not get a feature film shown in more than one major film festival (this can be the case for some second tier festivals too). You need to plan around festival submission dates. This may mean applying to a lot of festivals and having to turn down a festival as you already have accepted a premier screening. There are also rules on how long a films running time should be, the date and year the film was made (often it has to be completed 12 months before the festival) and how experienced you are as a director (there are certain awards and screenings for debut directors). As well as following the rules and guidelines per festival, it helps to submit as professionally as possible. Ideally apply to the early bird deadline, you may need to upload the film on to the festivals own website or they may use a platform such as withoutabox. You need to send the film in its best quality but also follow the guidelines for digital format and file size. You may need to write a synopsis and include further marketing materials (photos, directors bio, directors head shot). Its best to check and organise all of this information before you submit. There is a fee for entering film festivals ranging from a few dollars to a few hundred. The typical film festival plan is to submit to one or two major film festivals, a handful of second tier and lastly local city film festivals. A film festival may not show your film simple because they have already approved a film that year with a similar story. A festival is going to approve the more marketable films first. Which is why films from well known directors or starring famous actors are more likely to be included. Whether you are approved or not could be down to luck so be sure to submit to many festivals if you have the budget at hand. Even if you do get into a festival you will need to market your own film and sell tickets to the screening yourself. For an independent filmmaker the festival will not promote you enough to sell out at the theatre. If possible get your cast and crew to attend, market your film online and create a buzz around your film at the festival. If you can afford to attend every screening of your film, organise after show Q&As, get in contact with bloggers and press inviting them to attend. Make the most of networking meet ups and social events at the festival. Some film festivals have Film Markets where film distributors may show interest in buying your film. All of this is expensive. Which is why as filmmaker you should consider not only the production cost of your film but the time and cost of promoting and getting your film seen. In short research into film festivals even before you make your film. Create a list of festivals to enter, check out the cost of entering these festivals (and if you where to be selected the cost of attending), remember there are a lot of rules to abide by. I hope this short breakdown has helped. Do you have any experience of entering festivals yourself? What will be your own film festival plan?